1 of 3 Heat chopped semisweet chocolate bars in the microwave in 30-second increments until melted. 2 of 3 Ladle chocolate over 3/4 of each pretzel rod. 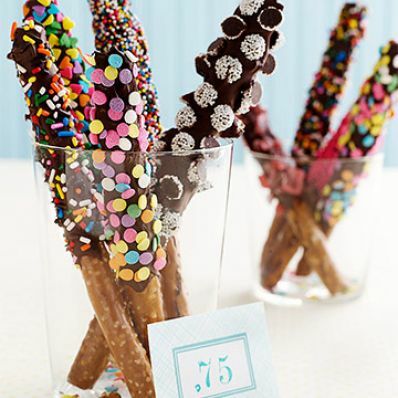 Tap or scrape off excess chocolate, then roll pretzel in sprinkles, crushed cookies, toffee bits or mini M&Ms. 3 of 3 Dry on a cooling rack until set.